Enjoy sushi to the fullest! 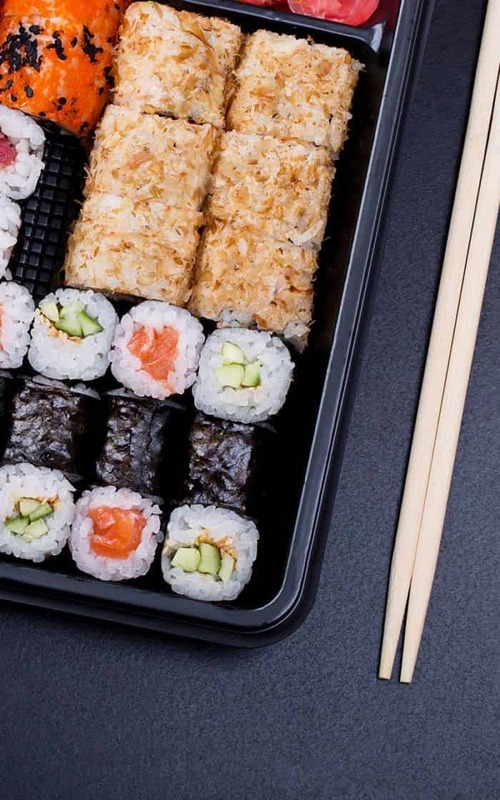 Order on GrabFood and satisfy your sushi cravings today! Well, we assume to know sushi very well as rice wrapped in seaweed and different toppings. However, there are mainly 3 groups of sushi that we need to know: nigiri, maki and Gunkan. These are the types of sushi commonly found in sushi restaurants and also Sushi King’s. Nigiri Sushi mainly encompasses sliced fish that can be raw, grilled or marinated on top of sushi rice. 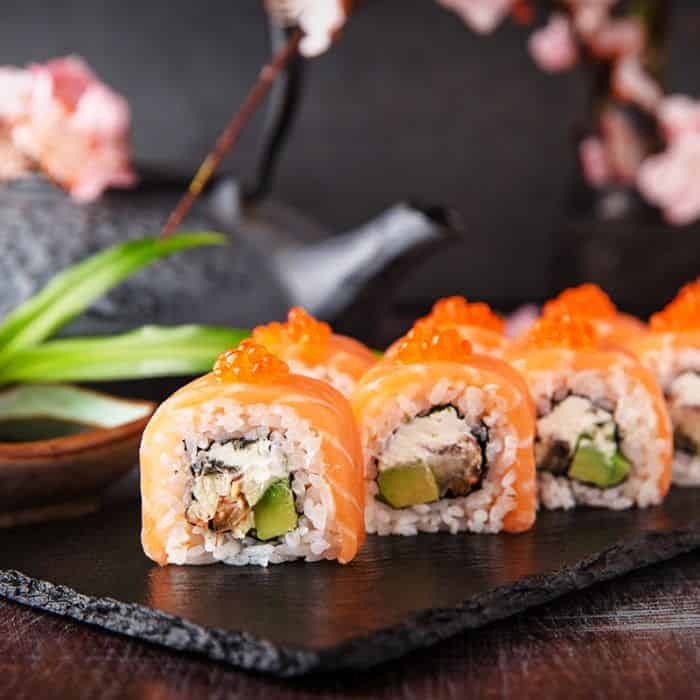 Maki essentially means “roll” and is mostly a round piece of sushi. The fillings are commonly in the middle and surrounded by rice cooked with vinegar and finally wrapped in nori. Lastly, Gunkan sushi has the same ingredients but is presented differently from the maki. It has the nori wrapped around with the rice as the base and the toppings will be placed on top of the oval-shaped cup based on the design. 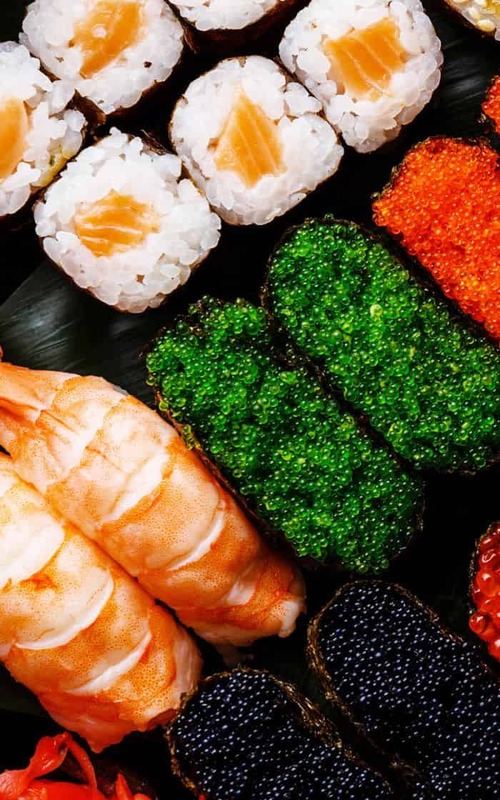 Now that you know of the 3 different types of sushi, do you know where you can get them? Tobikko is red-orange roe from flying fish, commonly found in sushi restaurants. The roe has a mild smoky or salty taste, with a note of sweetness. The texture would be slightly crunchier texture and a more distinctive taste of fish roe. Sushi King has their version of Tobikko sushi, simply nori, rice and tobikko on the top. 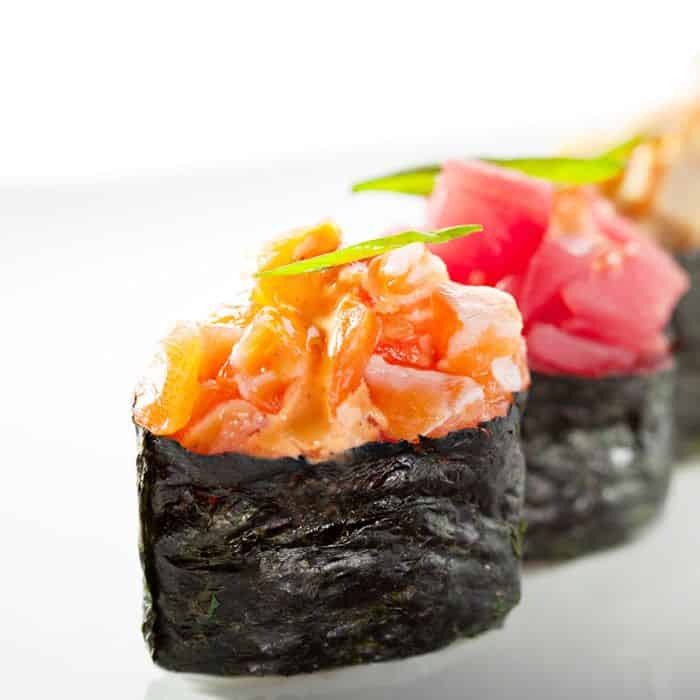 This simple yet delicious combination contains only 90 calories in a serving, which contains 2 freshly made tobikko sushi. Tsubukko is similar to Tobikko, but the roe originates from fishes, instead of specifically the flying fish. The roe is slightly smaller and more fine compared to Tobikko. The texture is slightly less crunchy, but it packs a punch with multiple fish roes popping in your mouth. This specific selection only contains 93 calories. Chuka Iidako means seasoned baby octopus. It is seasoned with sweet thick red sauce and the baby octopus are bite-sized. Finally, the sushi is prepared in a Gunkan style sushi format with the seasoned baby octopus going on top of the rice. The taste and texture of the baby octopus are sweet and chewy at the same time, combining with the vinegary taste of the rice and crispiness of the nori. Did you know that Chuka Iidako only contains 89 calories for 1 serving (2 portions)? Chuka Kurage is seasoned jellyfishes. This delicacy is well revered in Japan and even served as a starter dish for wedding banquets. Available all year round, the flavour and texture are sweet and meaty which means that it is going take some time to chew through the jellyfish. The flavour and spices in the marinated jellyfish would tie in well with the accompanying rice and nori, leaving you breathtaking dining experience with such a unique ingredient. Eating Japanese food can be a healthy affair for everyone. By watching the calorie counts of the sushi that you order and watching out for overeating, you can definitely enjoy sushi to the fullest! Now that you know all about Sushi King’s Gunkan sushi selection, locate the nearest Sushi King to you on GrabFood and satisfy your sushi cravings today!